Hollister is a city in and the county seat of San Benito County, California, United States. The population was 34,413 at the 2000 census. Hollister is primarily an agricultural town. The Mutsun Ohlone Indians were the first known inhabitants of the Hollister region. 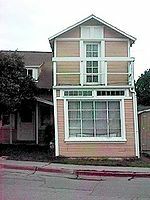 The town, then located in Monterey County, was founded November 19, 1868 originally as the San Justo Homestead Association, established by William Welles Hollister (1818–1886), a group that originally intended to name it San Justo. An association member, Napa vintner Henry Hagen, objected. Hagen argued that place names in California were dominated by Spanish saint names, and suggested that the state should have a town named after someone less holy. The City was incorporated on August 29, 1872. The western portion of San Benito County, including Hollister, was separated from Monterey County in 1874. The county was expanded eastward in 1887 to include portions taken from Merced and Fresno Counties. A local home suffering from structural distortion as a result of being situated on top of the Calaveras Fault. Hollister is well-known among geologists because it portrays one of the best examples of aseismic creep anywhere in the world. The Calaveras Fault (a branch of the San Andreas Fault system) bisects the city north and south, roughly along Locust Ave. and Powell St. The streets running east/west across the fault have significant visible offsets. The fault runs directly under several houses. Even though they are visibly contorted the houses are still habitable as the owners have reinforced them to withstand the dislocation of their foundations. Although there was extensive damage in the town after the 1989 Loma Prieta earthquake, this was due to a slip of the San Andreas Fault and was not related to the aseismic creep on the Calaveras Fault. Hollister is one of at least three California towns claiming the title of “Earthquake Capital of the World”, two others being Coalinga and Parkfield. As of the census of 2000, there were 34,413 people, 9,716 households, and 8,044 families residing in the city. The population density was 5,237.7 people per square mile (2,022.4/km²). There were 9,924 housing units at an average density of 1,510.5/sq mi (583.2/km²). The racial makeup of the city was 59.1% White, 1.4% African American, 1.1% Native American, 2.8% Asian, 0.2% Pacific Islander, 30.0% from other races, and 5.4% from two or more races. 55.1% of the population were Hispanic or of Latino of any race. In the city the population was spread out with 34.6% under the age of 18, 9.5% from 18 to 24, 33.8% from 25 to 44, 15.8% from 45 to 64, and 6.3% who were 65 years of age or older. The median age was 29 years. For every 100 females there were 101.9 males. For every 100 females age 18 and over, there were 98.5 males. County offices, such as the San Benito County Courthouse, are located in the county seat of Hollister. In the state legislature Hollister is located in the 12th Senate District, represented by Republican Jeff Denham, and in the 28th Assembly District, represented by Democrat Anna M. Caballero. Federally, Hollister is located in California’s 17th congressional district, which has a Cook Partisan Voting Index of D +17 and is represented by Democrat Sam Farr. The Hollister Free Lance is issued Tuesdays and contains a mix of local coverage and mostly AP national stories. The Pinnacle is issued Fridays. KXSM, at 93.5 FM, broadcasts a regional Mexican format. K206BQ, at 89.1 FM, rebroadcasts KUSP. State Route 25 runs northwestward to Gilroy and southeastward to Pinnacles National Monument and Coalinga (the latter via State Route 198). Route 25 through Hollister was until 1984 defined under State law as a segment of State Route 180. San Benito County Express provides local service within Hollister, regional service to San Juan Bautista and Gilroy, on-request “Dial-a-Ride” service, and paratransit. The State of California, Office of Statewide Health Planning and Development defines Hazel Hawkins Memorial Hospital as a General Acute Care Hospital in Hollister with Basic emergency care as of August 22, 2006. The facility is located in California Health Service Area 8 near (NAD83) latitude/longitude of 36°50′02″N 121°23′10″W﻿ / ﻿36.83389°N 121.38611°W﻿ / 36.83389; -121.38611. Motorcycles lined up during the 2008 Hollister Motorcycle Rally. The city has been the site of annual motorcycle rallies around July Fourth since 1947. The riot at the 1947 event was the basis for the 1954 film The Wild One. The rally took its present incarnation in 1997, and is known as the Hollister Independence Rally. There is no rally planned for 2010. In 2005, the Hollister City Council discontinued their contract with the event organizers, the Hollister Independence Rally Committee, due to financial and public safety concerns. The event was canceled in 2006 due to lack of funding for security, but returned in 2007. The format of the rally in 2007 differed markedly from previous rallies, with vendors on San Benito Street instead of motorcycles. The bikes were forced to park on side streets and a strict downtown curfew was imposed, with the entire area being locked up at 9:00 pm. According to the event’s promoter; Horsepower Promotions, the 2009 Hollister Rally has not been endorsed by the City of Hollister and has been canceled. Despite this, bikers continue to arrive at Hollister every July Fourth, even without vendors and sponsored, organized events. Because of its long history with motorcyclists, Hollister is considered the “Birthplace of the American Biker”.